What is the meaning of Mahasati Meditation? "Mahasati" is a Pali (ancient Indian language) term. Maha means great or big; Sati means self-awareness or mindfulness. So Mahasati means great self-awareness, total self-awareness, or perfect self-awareness. If one cultivates self-awareness, he/she will be able to know his/her bodily movement more and more. When he/she knows the bodily movement all the time, the "knowing element" will work by itself automatically. At this point, the knowing element grows/develops up to its full capacity. It's then called "Mahasati." There are so many meditation methods, why Mahasati Meditation? Because Mahasati Meditation is a natural method which we can practice anywhere, anytime and in all activities. "Knowing Element" is a pure and natural quality that exists in every human being. Human body cannot stay still. It moves naturally all the time. 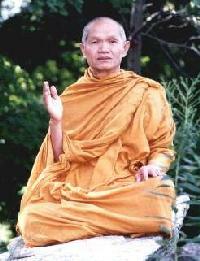 Mahasati Meditation is a method that emphasizes the present moment all the time. Practitioners will see their body and mind, and their own thought which is the source of suffering (anger, greed, delusion). 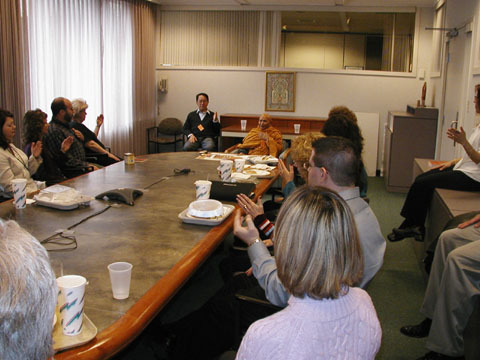 How long should we practice Mahasati Meditation each day? As long as we can. The more, the better. Whenever we have free time, practice formal movement (rhythmic hand movements or walking meditation). Also at works or while we are doing something else, we should be aware of our bodily movement - one thing at a time. For example, when we are washing the dishes, be aware of the hand that rubbing the plate. When we're driving a car, we can observe either the hand or the foot that's moving. Choose only one at a time. Or when we stop the car at the red light, we could move our finger up and down. Can I close my eyes when I practice because I feel more distracted if I open my eyes? To see is the function of the eyes. We have to work with our eyes open. Mahasati Meditation is a natural method so we are not going to do anything against nature. Some of us who have been practicing with eyes closed might feel uneasy at the beginning. But after practicing Mahasati Meditation for a while, we'll get used to it and then be able to apply the technique in our daily activities. Mahasati Meditation only talks about knowing bodily movement in the present moment, how about love and compassion for others? Mahasati Meditation does not ignore love and compassion. "Knowing element" is a great perfection quality. Wisdom, love, compassion, joy, and peace are all in it; but wisdom is the leader. Love and compassion without wisdom as the leader is painful and can create more problems. What to do with breathing? We breathe naturally. While we're practicing rhythmic hand movements, we simply know our hand movement, know that it is breathing in or it is breathing out. That's enough. Don't recite "in" or "out". And no need to know that it's a long/short exhalation or inhalation or it's a fine or coarse one. Should we combine the breathing to the movement? No. Just observe one movement at a time. If you want to be aware of hand movements, ignore the breathing, and vice versa. How long should we practice in sitting posture before we change to walking? The important point of Mahasati Meditation is to know the bodily movement and try to connect the chain of knowing as long as possible. We are not going to torture the body. So if we need to change the posture we can do it at any time. But while we're changing, be aware of our movement. 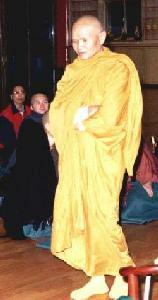 I have no idea about Buddhism, can I practice Mahasati Meditation? Yes, of course. Everyone can practice Mahasati Meditation regardless of age, gender, occupation, education, culture, nationality or religious belief. As long as we can communicate and understand how to practice. The concept of the practice is to know what we're doing at the moment or to be with our bodily movement in the present moment. I have a lot of stress at work, it also creates health problems. I'd like to know if Mahasati Meditation can help? Most people laugh and cry because of their own thought. They only know thought but don't see thought. If we only know thought, we'll follow it, and don't know how to get out of it. If we have strong self-awareness we'll see thought. Thought will stop. While I am practicing, I still think a lot. What shall I do? In this method, we don't suppress thought. Let thought flow freely but we don't pay attention to thought. We pay attention to our bodily movement. So let go of thought; come back to movement.